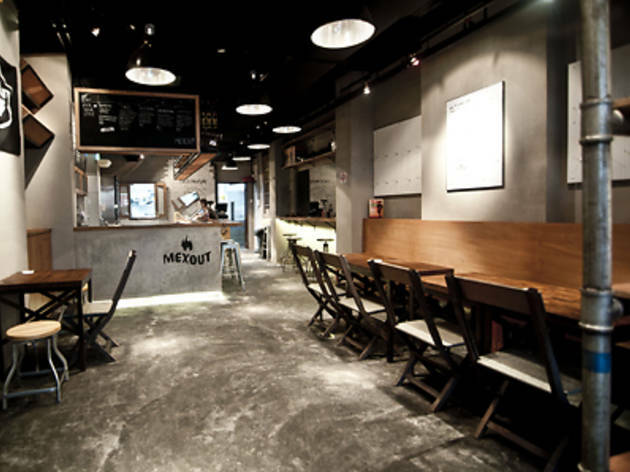 Hot on the heels of Min Chan’s fusion Mexican takeaway Pistola and Lucha Loco at Duxton Hill comes yet another Mexican eatery, MexOut. It’s opened by three young expats – Marcus Jilla, Robert Kindler and Jared Goldberg – who are firm believers of ‘fresh-Mex’, a casual style of cuisine modelled after American burrito chain Chipotle, which is known for using fresh and natural ingredients. 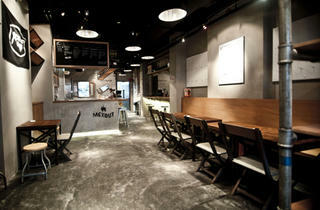 They’ve obviously given great thought to MexOut’s design too, from the raw, industrial urban décor to the witty drink coasters. The multi-step ordering process first involves selecting the base – burrito ($9/8-inch, $13/12-inch), warmed tacos ($13/three), or rice ($13, with tangy Mexican-style red rice) or salad ($13) bowls, which come served in metal tiffin boxes. Choose your protein next; the base price gives you the option of chargrilled chicken or cochinta pibil (braised pork shoulder), though we recommend paying the $2 supplement for the tender carne asada made with air-flown New Zealand meat in cilantro, onions and paprika, or the beef barbacoa – a cumin-laced brisket with a kick. To finish up, add on beans, salsas or extras like guacamole (add $2) and shredded cheese (add $0.50), and continue to the cashier to pay up. We’re big fans of the salsa fresca; if you like a bit more tang to the final product, be sure to ask for the special cilantrolime juice too. It’s a pretty efficient assembly line process, even when there are a few people waiting – and the beauty is that it really allows you to customise your meal.